You have booked your newborn in-home session. Here are five things you can do to get ready for your photos. Breathe In Photography offers Welcome Me Sessions in Ottawa Gatineau and surrounding area. Coffee? I'll bring it! Look at the images online for clothing companies you love and see how they have coordinated colours and clothes among family members for inspiration. Be aware of the colours in your home - be sure not to clash with the colours on your walls for example. Siblings: this is a great opportunity to add lots of colour and fun to your images - bright pinks, blues, reds for example can be fun on children. Dad: jeans, neutral t-shirt or button up shirt with top button undone - be comfortable. Be you of course too! Baby: a simple white onesie, neutrals - and be sure to have a few back up options! Wraps and carriers - if you have a favourite wrap you've been using, be sure to let me know and perhaps we can include it! Give baby a bath (this might even be baby's first bath depending on the timing of your session). This is a good activity to save until the end of your session. Feeding - Breathe In Photography specializes in feeding photography including bottle and breastfeeding. If this is something you want captured, please let me know! Changes - ok, I realize this isn't something you can "plan", but since it's likely to happen anyway - let's keep it in this list. Changes of clothes or diapers can also lead to perfectly natural moments which are my favourite to capture. A card game or lego or blocks with older siblings - your newborn can be in arms while your family plays a game. Newborns are unpredictable - she might sleep through the whole session, she might be awake the whole time. There may be moments of fussiness. Siblings may not be interested. Baby might need a diaper change or need to be fed. We will move through your session with a go with the flow vibe so we can capture as many genuine moments as we can. 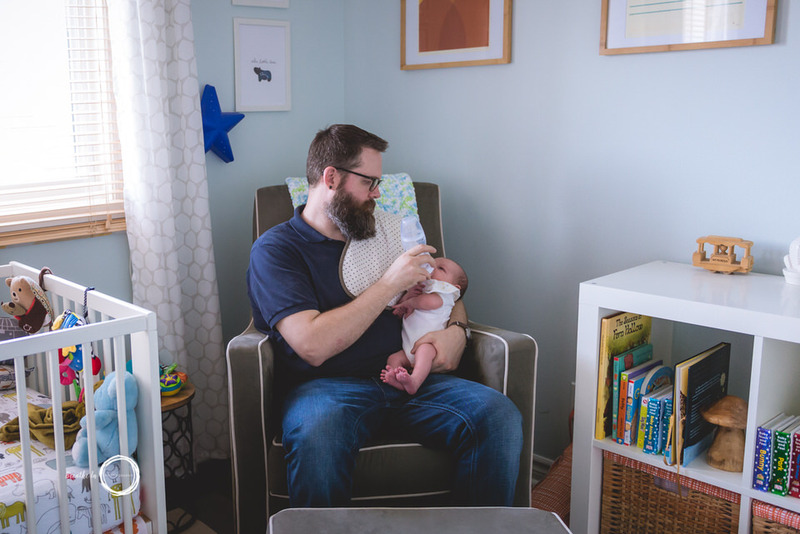 This is real life - and it is the setting for your beautiful in home newborn images. Put away the clutter, things like cups at the side of your bed, toys and books strewn on the floor. The thing is, when I arrive, older siblings are likely to take all of those things out again - and that's okay. Open all the window coverings so I can have a good look at the light in your home when I arrive. Buy flowers! Add a little something special to your home for your session. Flowers can add a beautiful pop of colour - or a little neutral calm. It's up to you. Be sure your windows are clean - it's likely some of your images will be near or in front of windows. It is up to you as you know your family and children best. If you want nursing or bottle images, be sure that baby will be hungry when I arrive. If you want baby sleeping - often a good feed before I arrive will be the perfect plan. Be prepared with extra clothes for spit up though! If you children need snacks, have them nearby. Sometimes the cutest images are ones of a child having a snack - you never know. These decisions are up to you based on your goals of your session too. Curious about booking an in home newborn WELCOME ME session with Breathe In Photography?